There is much truth to the observation that every bride is beautiful. In her own way, each glows with happiness and excitement. What could be more beautiful than that? The secret is starting early so you have time to cultivate that glow with good habits. There are steps even those on the most frugal of budgets can take in the months leading up to the wedding. The best thing you can do to be most productive throughout planning and look your best on your wedding day is to take care of yourself by eating right and staying well hydrated. This helps you stay on top of your game by warding off illness and stress, thus avoiding lengthy timeouts from planning your wedding. While the term “eating right” seems to morph about every six minutes, most agree it is important to (1) eat plenty of raw or minimally processed fresh vegetables and fruit, (2) avoid chemically laden junk food, and (3) drink at least eight glasses or half your weight in ounces of water each day. Many of us take vitamins as well. By doing so, you give your body the nutrients, fiber, and hydration it needs to keep your immune system healthy and function properly. In addition, the water helps keep your skin (including lips) supple and soft. Remember, you are not only the star of this show; you are also the director, the casting crew, the costume department, and the set designer. If you have forgotten to take care of yourself in the midst of these myriad responsibilities, it’s no wonder. But you can turn over a new leaf and start putting your mental well-being at the top of your to-do list; if you go down, so does the show! 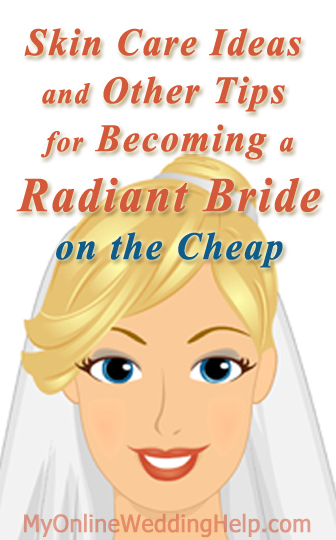 Consider the 8 relaxation methods for stressed out brides here. Did you know that your skin is a living, breathing organ? With many of the latest fashions in wedding gowns, a lot of your skin may be showing, so you will want to start several months ahead to pay attention to how you care for it. First, check your skin for blemishes, redness, and dryness; then go on a mission to find the budget-friendly solutions to correct them. Try over-the-counter products and home remedies for problem skin before seeking help from a dermatologist. The methods our great-grandparents used to clear up their skin may work for you as well. Also, there are now multiple affordable skin-care brands with home-treatment kits and products that make having healthier-looking skin part of our daily regimes. Rely on customer reviews, not price, to choose skin-care items. When you shop, understand that more expensive does not necessarily mean better, so focus on matching products to your skin type and researching customer reviews before making your final choices. You may first want to try skin treatments made from ingredients already in your cabinets. Here are some common ingredients based on particular skin conditions. For specific recipes, try asking older relatives or researching online. Oily skin. If you are like many of us who suffer from heavy shine, it is important to begin a skin-care regime months before the wedding and stick to it. This includes at least a cleanser, astringent, and mask. Milk, honey, lemon or other citrus juice, aloe vera gel, oatmeal, ground almonds, apples, and natural clay are some of the natural ingredients you may use if you want to try mixing your own products. In addition, you will also want to keep an oil-blotting powder, tissues, or film nearby in your wedding emergency kit to take care of unwanted shine throughout the day. Acne. Breakouts often go hand-in-hand with oily skin, so taking steps to control the oil can help clear your face and back. Beyond that, there are numerous home remedies for acne, including applying lemon juice, honey, tomatoes, potatoes, baking soda, and toothpaste. Dry skin. Emphasize oils in your skin-care regimen. Baby, olive, coconut, and sesame oil are all reportedly effective when applied to moist skin. Your environment plays a role as well. Therefore, investing in a humidifier can actually help keep your skin moisturized. Redness. If you have rosacea, a flushed appearance of cheeks and nose, or other redness, there are several fixes that may help. Applied to the skin, these everyday items have been known to calm redness: a honey-and-milk mixture, moist chamomile tea bags, cucumber, and masks made from oatmeal or natural clay. Also, if your skin tends to flare up after eating certain foods, be sure to avoid these just before the wedding. If you find the color will not completely subside, you can find a product that covers the redness and practice applying it flawlessly. Mineral make-ups have a reputation for evening out the ruddiness. There are also some over-the-counter products made specifically for redness. Ask the pharmacist at your drugstore what she recommends.